Dr Terry Griffin specialises in big data analytics and the valuation of precision agricultural technologies and big data. 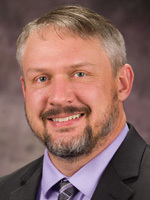 He holds a professorship at Kansas State University as the cropping systems economist with research emphases in big data and precision agriculture. He earned his bachelor’s degree in agronomy and master’s degree in agricultural economics from the University of Arkansas and his PhD in Agricultural Economics with specialising in spatial technologies and farm management from Purdue University. He developed methods to analyse site-specific yield monitor data from field-scale experiments using spatial statistical techniques. Terry is a charter member of the International Society of Precision Agriculture. He recently received the 2014 Pierre C. Robert International Precision Agriculture Young Scientist Award for his work in data utilisation. He has also received the 2012 Conservation Systems Precision Ag Researcher of the Year and the 2010 PrecisionAg Awards of Excellence for Research.